Named the Fountain of Youth' for hair, Philip's reconstructing shampoo rejuvenates and revitalises all hair types, leaving even chemically-damaged strands with a dramatically youthful radiance from the very first use. Its power-packed formula includes healing amber oil to nourish and heal hair, delivering long-lasting body, bounce and shine. 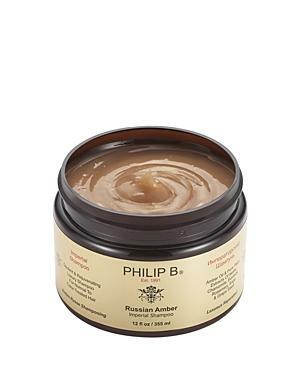 Philip B Russian Amber Imperial Shampoo - 3 Oz. Philip B Russian Amber Imperial Shampoo - 12 Oz.